Happy World Raw Food Day! Today is a celebration of raw food here, there and everywhere. World Raw Food Day, or Weltrohkosttag as it is called here in Germany, is about inspiring people to eat more raw and gather together for a raw food picnic, potluck or elaborate feast. Here in Berlin, there are many events happening überall; a massive potluck in Alexanderplatz, virtual potlucks online, picnics in random parks and raw food demonstration classes (un-cooking classes, if you will) by leaders in the raw food industry. I’m a huge advocate of eating a mainly plant-based diet, which is high in fresh fruit and vegetables, legumes, whole grains and super foods and I feel pretty, pretty good. I aim to eat a bright rainbow of goodness every day and make an effort to eat raw where possible. By adopting a plant-based diet, you are supporting your overall health and well being by accessing the nutrients you need to feel fighting fit and fabulous. In keeping food raw, you are retaining those nutrients that may be lost during the cooking process, as well as the vitamins, minerals, proteins and enzymes that can also deplete. By making the decision to keep some of your food raw, you will be doing your body some serious good. A very dear friend of mine, Kauia, is also a big fan of raw foods and has been most informative and inspiring. You can check out her blog for some further raw power inspiration. This salad is the epitome of a 100% raw food celebration. The sprouted quinoa is a shining example of pure, healthy goodness as through the sprouting process the natural enzymes are activated, it is easier to digest and the vitamin content is boosted. 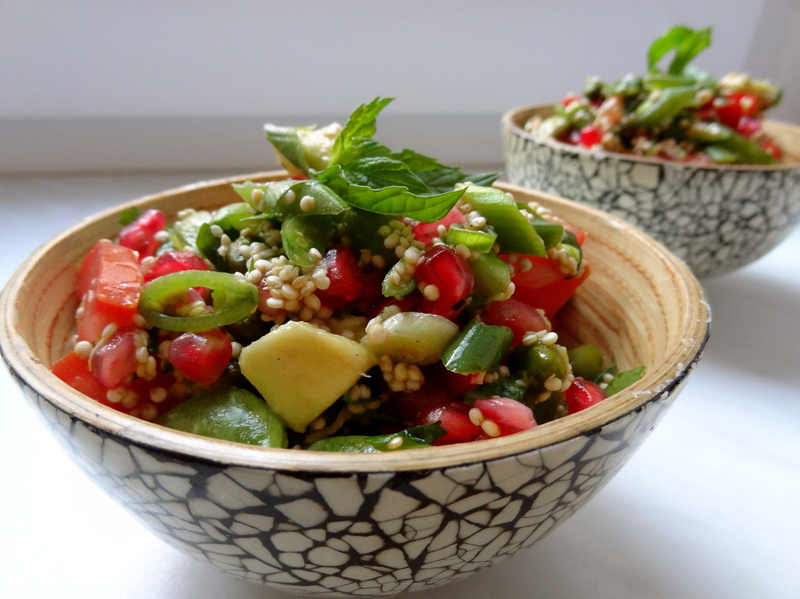 In this salad there are some interesting flavors and textures going on, with the creamy avocado contrasting beautifully with the sprouted quinoa and pistachio, whilst the ruby-red jewels of the pomegranate offer a delightful burst of tart flavor. The crunchy snow peas and spring onions along with the fragrant mint and parsley also give a hearty dose of fresh. Delectable, satisfying and seriously good for you. Soak the sprouted quinoa in warm water for about an hour until softened. Drain off any excess water by passing through a very fine mesh sieve and then place in a large serving bowl. Deseed the pomegranate by cutting it in half and loosening up the flesh and seeds. Over a wide bowl, whack the pomegranate with a wooden spoon repeatedly until all of the seeds are in the bowl. Repeat with the other half and remove the flesh that may have also been collected. In a jar, add all of the dressing ingredients and shake well. Add all of the remaining ingredients into the serving bowl and mix well with the dressing. Allow to stand for 30 minutes for the flavors to develop. Garnish with sprigs of mint and share the raw food love with your nearest and dearest, whilst informing them of why eating more raw is a beautiful thing. * Sprouted Quinoa is available in all good health food stores or you can have a crack at sprouting it yourself.